An LTTE leader who was once a deputy to its supreme leader Velupillai Prabhakaran was a RAW agent, recruited as early as 1989, a new book says. NEW DELHI: An LTTE leader who was once a deputy to its supreme leader Velupillai Prabhakaran was a RAW agent, recruited as early as 1989, a new book says. Journalist Neena Gopal, who interviewed former Prime Minister Rajiv Gandhi moments before he was assassinated in 1991, says that Gopalaswamy Mahendrarajah alias Mahattaya was a Research and Analysis Wing mole. "The man was cultivated and positioned by RAW as their mole inside Prabharkaran's hitherto impenetrable ranks as early as 1989," she says in her book "The Assassination of Rajiv Gandhi" (Penguin). "He would become their deep asset, the one who would subvert the insurgent movement from the inside, and had been tasked to eliminate Prabhakaran and take over the LTTE," the book says. RAW's links with Mahattaya, who the LTTE later executed on charges of being an Indian intelligence agent, was not known to the Indian Military Intelligence or the Intelligence Bureau, it says. The LTTE reportedly suspected that it was Mahattaya who tipped off the Indians about a Tamil Tiger ship in January 1993, leading to the death of former Jaffna LTTE commander Kittu, a childhood friend of Prabhakaran. According to the book, Mahattaya was reportedly seized by the LTTE and taken to a camp where he was "tortured over a period of several weeks and months until he could barely speak, sit or stand. "He was finally executed in December 1994, 19 months (later). Some 257 of his men were executed and their bodies dumped, LTTE style, in a pit and set on fire." Despite the RAW's covert penetration of the LTTE, the Indian military, civilian intelligence and its diplomats worked at cross-purposes when the Indian military was deployed in Sri Lanka's northeast in 1987-90, the book says. The Sri Lankan military finally crushed the Liberation Tigers of Tamil Eelam (LTTE) in May 2009, leaving thousands dead in the final months of a brutal conflict that began some 30 years earlier. The book also suggests that the RAW -- which like other Indian institutions felt betrayed after Prabhakaran ordered Gandhi's killing -- may have had a hand in the LTTE chief's elimination. "RAW sources say that until the very last minute, Prabhakaran was tricked into believing that a surrender (by him and his men in 2009) was a viable option, and that he would be handed over to a neutral international group and not the Sri Lankan government as Colombo wanted." The RAW's ability to cultivate assets in the LTTE was one reason for its overconfidence vis-a-vis the Tigers. Accordingly, the agency failed to factor that the LTTE leader would avenge the fighting against the Indian military in Sri Lanka by targeting Rajiv Gandhi one day. Neena Gopal quotes a senior RAW officer as saying: "If we had read the signals right, if we understood what was going on in Prabhakaran's mind, who knows, we could have prevented this. "It was our fault, we made a huge error of judgement. 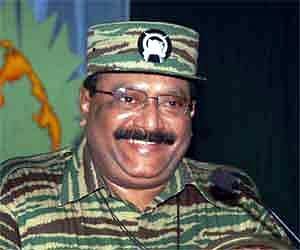 We misread Prabhakaran. We never believed he would turn against us in this manner. We should have seen it coming. We didn't. "We failed Rajiv Gandhi, we failed to save his life." The author had been interviewing Gandhi until he reached the election rally ground at Sriperumpudur near Chennai on the night of May 21, 1991. A little later, Gandhi was killed by a LTTE woman suicide bomber. She says that Gandhi "had an almost prescient premonition of his own death". The book says there was complete lack of security at the venue and it was not well lit too, a point even Gandhi noticed. "Look at Mrs (Indira) Gandhi, Sheikh Mujib, look at Zulfiqar Ali Bhutto, at Zia ul-Haq, (S.W.R.D.) Bandaranaike." The book says: "Within minutes of making that bone-chilling prophetic statement that hinted that there were dark forces at work and he knew he was a target, Rajiv Gandhi himself would be gone."